Practice Ecotourism walkin in a series of trails for hiking through primary rainforest, secondary growth and open land where you can see monkeys, toucans and parrots in their natural habitat and wild flowers of all kinds! Protecting approximately 54,539 hectares (134,764 acres) of humid rainforest and 2,400 hectares (5,930 acres) of ocean, Corcovado National Park has become an international attraction for the ecotourist. According to National Geographic Magazine, it also holds 4% of the entire world's biodiversity, for that reason it is a paradise for ecotourism. It is the home of the largest population of scarlet macaws in the country and it is also the home of almost 400 species of birds, 140 species of mammals and 116 species of amphibians and reptiles, as well as 600 species of insects. Six natural eco-systems have been identified in the park and it protects endangered species such as the jaguar, puma, crocodile, tapir, poison dart frogs and the Harpy eagle. It is the best place to catch a glimpse of the diverse wildlife that exists in Costa Rica and the best destination for ecotourism. The Ecotourism tour starts at around 6:30 am at the highway entrance to the hotel where you will be picked up in a minibus. Breakfast at Sierpe. A 1-hour and a half boat ride to San Pedrillo, the park entrance. A 3 hour hike in the park with a professional guide. Lunch. Back to Sierpe and the hotel by 6:00 pm. 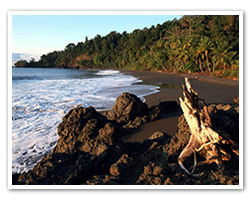 La Merced Wildlife Refuge is located on the Pacific Coast of Costa Rica near Punta Uvita and the Ballena Marine National Park. The refuge has an area of 1,250 acres which is comprised of a forest reserve with both primary and secondary tropical wet forest as well as pasture, a mangrove estuary, frontage on the Morete River and beach. It offers a wide variety of habitats to explore. A nocturnal walk is also available and may produce sightings of the Spectacled Owl, the Crested Owl, the Black and White Owl, and the Common Paraque. You can explore the rainforest through a series of trails for hiking through primary rainforest, secondary growth and open land to give you the opportunity to observe the protected flora and fauna. Experience the behavior of insects, birds, mammals and reptiles in their natural habitat and observe the extensive variety of tropical plants. The hike covers areas where the howler monkeys are always heard in the mornings. 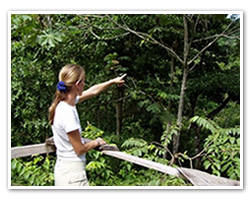 A 4 hour ecotourism tour with a bilingual naturalist guide: English and Spanish. This National Refuge has 815 acres of land that covers a large variety of habitats, from wetlands and secondary forests in the lowlands to primary forest on the highland coastal ridge. It has 7 km of walking trails and 3 km of pristine beaches to be explored and enjoyed. It also has an orchid garden and a butterfly garden. They can arrange bird watching tours or ecological tours with excellent bilingual guides. Discover the leaf eating ants or the sleepy sloths. Try the Rainforest Canopy Tour or go the mangrove swamps. 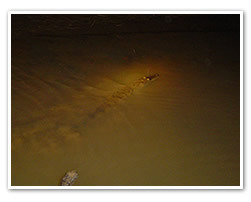 A jungle night tour is also available and each tour will let you experience real ecotourism. Did you know that 70% of activity in the wild occurs either at sun down or at night time? In other words, night time is the perfect time to go and see all these creatures. There is no better place to see them than in a mangrove swamp where the environment is teaming with life! The Grand Terraba River is the longest river in Costa Rica and the one that carries the largest volume of water. It feeds the largest concentration of mangrove swampland on the Pacific side of Central America, especially in its lower portion towards the mouth of the river. With this said, this tour will highlight some of the inhabitants of this complex environment such as bats, opossums, sloths, owls, snakes, raccoons, frogs and of coarse, the main and most fascinating one the American Crocodile. We invite you to enjoy and experience a whole different way of seeing wildlife by experiencing Ecotourism in Costa Rica. Since you usually get to go on Eco-tours like this during daylight hours, this tour will surely give you a whole new perspective on wildlife. 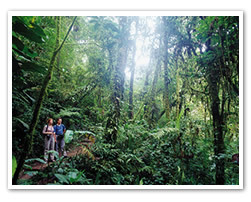 Our Ecolodge offers the best Costa Rican ecotourism options for you!